If you’ve thought about working from home as a call center agent but aren’t quite sure where to start, this article should help. As a call center agent, you’ll provide some type of service to customers via telephone. Some jobs focus on customer services, whereas others focus on telemarketing, health services, and more. With so many remote call center jobs from home to choose from, the choices can become overwhelming. Each company has its own requirements, schedules, and pay rates to consider. The good thing about having so many to choose from is you’re likely to find one that really fits your needs, from its hourly rate to its flexibility. Of course, each company has its own set of requirements, but these are the most common requirements for call center agents. As you can see, an at-home call center may not be a viable option for parents with young children at home, since background noise is a big problem for these jobs. You can get around this by working an overnight shift when the kids are asleep, but that doesn’t work for everyone. Or, invest in a babysitter during the hours you work. The most important thing to focus on is your office space. It’s imperative to have a dedicated space – like a spare bedroom – to work from. This helps prevent background noise and distractions while you work and keeps your personal and work life separate. If you think this type of job is perfect for you, then read on to find the perfect work from home call center job. 1-800-Flowers – Hires seasonal call center agents to take orders from customers and input them into the system. Only available in select states in the U.S.
ABC Financial – Specializes in billing and customer service for gyms and health clubs. Customer service reps handle inbound and outbound calls and enjoy paid training, paid time off, and a benefits package. Acanac – The Canadian digital home phone and internet service company hires customer service reps at home. Accolade Support – Work as an independent contractor providing call center services to Accolade Support’s clients. ACD Direct – ACD Direct offers advancement opportunities once you’ve established yourself as a reliable agent. Must pay $45 initially for background check. Afni@Home – Occasionally has open remote opportunities for call center agents in the United States and Philippines. Alorica (Review)– Hires call center agents in the U.S., Philippines, and Latin America. Most agents make about $10 per hour. Amazon – Amazon’s virtual call agent jobs are difficult to snag because they’re so in-demand, but it does have them. However, bilingual jobs are often available. American Express – The credit card company sometimes has openings for remote customer service representatives. American Support – Provides fully-virtual contact center services to clients. Has full-time and part-time work available. Answer First – Hires agents in the Tampa Bay, Florida area since you’ll need to train on-site first. You’ll get full benefits after six months. Apple – Apple@Home agents provide customer service to Apple customers and will receive a Mac from Apple if hired. Arise – You’ll own your own business, but can sign up with Arise to help get matched to its clients in need of inbound calling services. Ascend One – This debt management business sometimes has openings for remote call center agents. Aspire Lifestyle – Occasionally seeks work from home call center agents within the United States. Asurion – Asurion provides customer service to its clients via its remote call center agents. Athletic Greens – The health and wellness company occasionally has openings for virtual agents to provide customer service to its clients. Blooms Today – Help Blooms Today customers place orders or find answers to their questions. Usually hires before busy seasons, like Mother’s Day or Valentine’s Day. Capital One – Offers different customer service jobs for remote agents based on level of experience. Care.com – Hires Member Care Representatives to work remotely providing phone and e-mail support to customers. You must be able to train at the Watham, Massachusetts office before working remotely. Carlson Wagonlit Travel – Those with travel experience can help customers plan their travels. Hires in Poland, U.K., U.S., and Philippines. Colony Brands – The parent company of The Swiss Colony sometimes has remote openings for call center agents for its brands. Concentrix – Provides full benefits from at-home call center agents, including medical insurance and paid time off. Contract World – You can find clients for your own call center business through Contract World. Accepts agents in the United States and Canada. Convergys – Offers customer service positions with paid training. Cox Communications – Includes a full benefits package for its customer service representatives. Cruise.com – Customer support positions are available for agents in the United States, excluding Hawaii and California. Must attend mandatory online training blocks before you can start. Deal Dash – The auction site hires remote workers to provide customer service over the phone, e-mail, and chat. Direct Interactions – Looks for remote workers for inbound and outbound calls. Does not hire from HI, MA, MI, NJ, NY, PA, or Washington D.C.
Esurance – Sometimes has openings for remote customer service agents, but requires on-site training at one of its locations. EventBrite – Provide customer service to EventBrite customers via phone and e-mail. 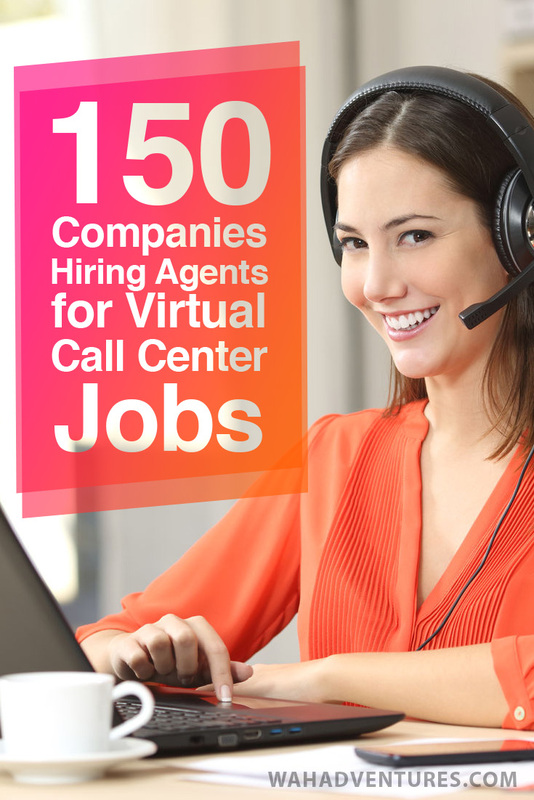 Guthy-Renker – Occasionally has openings for virtual call center agents to provide customer service for its infomercial products. Groupon – Hires remote agents from various countries; bilingualism is a plus. Hayneedle – Has seasonal openings for customer care positions, but you must be a Nebraska resident to be able to report on-site when needed. Home Shopping Network – The television shopping network hires remote agents. Must live near a HSN location. Hotel Tonight – The hotel-finding app often has openings for bilingual customer service representatives, but you live in one of the specified states. Intuitive Solutions – You’ll take orders from Pizza Hut customers and send them to the right store. Pays $7.50 to $10.50 per hour. Jewelry Television – Occasionally has openings for at-home customer care providers to respond to incoming calls. Kelly Services – Offers flexible schedules for call center agents who want to work from home. Lands’ End – You can find seasonal and part-time work from home customer service positions for Lands’ End, but you must be able to train at an on-site location. LiveOps – You can be your own boss with LiveOps, providing call center services to its clients. You can match with opportunities that align with your skills and interests, like roadside assistance or health care. Mark Travel Corp – Answer calls and e-mails to help interested people plan their vacations. Mondelez International – The popular snack company hires call center representatives from all over the world to provide customer support. Neiman Marcus (review) – Occasionally hires United States call center agents to answer billing and other order questions. NexRep – NexRep has several types of clients, from meal delivery services to online auto services, that you can provide call center services to from home. Most agents make about $15 per hour. Nordstrom – Nordstrom offers seasonal Customer Care Specialist positions in California, Washington, Texas, Florida, Massachusetts, New Jersey, and Illinois. Order Up – Occasionally has openings for virtual customer service representatives to assist customers of the meal delivery service. PODS – The helpful moving company sometimes opens virtual positions for customer service agents to provide customer support. RiseSmart – RiseSmart occasionally has remote customer service positions for prospective clients of the career transitions company. Romanoff Renovations – Romanoff focuses on flooring solutions for the home. It has open positions for remote customer support in specific states, and preferred work experience at Home Depot is preferred. SEI – Sometimes has openings for customer service specialists to help handle payment processing. Position includes paid training, vacation time, 401(k), and other benefits. Sitel – Offers paid training, vacation and holiday pay, and various other benefits for inbound call agents. Sutherland – Occasionally seeks virtual call center agents for a variety of customer support positions. Pay rate is reported to be between $8.50 and $12 per hour. Sykes – Sykes is a leader of work from home call center agent jobs all over the world. Sykes has several call types available for its agents, such as billing, inbound calls, and warranty support. Synergy Solutions – Hires call center agents for outbound calling, appointment setting, political outreach, and more. Teleflora – Occasionally hires remote customer service agents to provide customer support to inbound callers. Teletech – Seasonal call center agents can benefit from a flexible schedule and earn $8.50 per hour or more from home. The Womb Sauna – The healing company for women has contract positions for call center agents to help enroll candidates for the company’s Womb Sauna Practitioner certification. Transcom – Seeks customer service representatives with at least six months of customer service experience. UCare – UCare is a health plan provider that sometimes opens positions for call center agents to provide support from home answering callers’ questions. Should have relevant healthcare experience. Ver-A-Fast – Provide outbound customer service by asking for feedback from newspaper customers and informing the companies. Must be able to commit to at least 16 hours per week on a flexible schedule. Wizards of the Coast – Seeks temporary customer service representatives to provide support for adventure gamers. Working Solutions – Matches call center agents to clients in need of the services. You can apply to the programs you’re interested in. World Travel Holdings – Start a career as a virtual travel support agent. A deposit is required for the appropriate equipment, but it’s spread throughout your first paychecks. Wyndham Worldwide – Occasionally hires inbound customer service agents to handle questions and comments from customers. Some college education is preferred. Xact Telesolutions – Answer phone calls, chat and e-mail requests to provide customer support for Xact clients. Full-time and part-time positions are available, but you must be available to work weekends and evenings. Xerox – Xerox is quickly becoming a leader in work from home position. It often has open customer support positions for remote workers, but you’ll need to live within a specific distance from an on-site location for training. Alaska Airlines – Outsources its reservations support to at-home workers. You’ll be part of its union and earn $12.14 per hour. American Airlines – Occasionally has openings for remote reservation agents, but you’ll need to live near a specific location for training. Delta – Hires home-based reservation agents to help customers reserve their flights. Reported pay is around $11 per hour, and you must work on-site for at least six months before working remotely. Enterprise (Review) – The vehicle rental company hires Reservation Sales Representatives to work remotely. Positions are full-time and pay $12.50 per hour plus commissions. Must commit to 40 hours per week and various schedules. Hertz – Another rental agency, Hertz hires reservation specialists to work from home. Hertz offers sign-on bonuses and various bonuses throughout the year. Hilton Worldwide – The popular hotel company hires reservation agents to work from home all over the United States. Positions are full-time and require at least one year of customer service experience. JetBlue – JetBlue hires remote reservation agents based in Utah, as you’ll be required to visit the Utah location for training. Starwood Hotels – Starwood Hotels has positions for remote workers inside and outside of the United States as a reservation specialist. U-Haul (Review) – U-Haul’s popular reservation agent positions get booked up quickly, but they open new positions frequently. Positions are seasonal from May through August and you’ll need to attend four weeks of online training. Pays $10 per hour plus bonuses. 2U – A bachelor’s degree is preferred for remote tech support positions for 2U and you’ll need to commit to a full-time schedule. A Small Orange – The small hosting company has remote tech support positions to assist its current and potential hosting customers. Offers a base pay plus commissions. Accolade Support – Always has applications open for technical support agents. Apple – One of Apple’s most-desired at-home position is its tech support agent position. You’ll get a free Mac computer, paid time off, career advancement opportunities, and more. Arise – Arise has tech support specialist positions for remote workers throughout the U.S. and offers impressive benefits packages. Arvixe – Occasionally has openings for virtual call center tech support agents. Direct Interactions – Independent tech support agents can apply from several states, excluding HI, MA, MI, NJ, NY, PA, and Washington D.C.
Intermedia – Work at home tech support positions using live chat and phone are available after a three-week online training. SEI – Seeks part-time help desk workers for $12 per hour, plus shift differential and other benefits. Support.com – Hires Remote Services Technicians across the U.S. for $10.25 per hour after paid training. Supportspace – You can provide tech support for a variety of services via phone and chat. Teleperformance – Hires technical support representatives with at least six months of experience for $13 per hour. TeleTech – TeleTech has plenty of remote opportunities, including tech support for its various clients. Ven-U – The e-learning company hires tech support agents to work from home providing assistance to its customers. A Better Call – Specializes in Business-to-business (B2B) telemarketing and lead generation. AccuConference – Minimum of two years of social media experience with B2B companies is required. AdviseTech – This position requires only a few hours per week of outbound telemarketing. Ascend One – Occasional openings for Sales Associates are available, but you must live in either Maryland or California. Blue Zebra – Help increase business sales through cold-calling and appointment setting. Earn between $15 and $25 per hour. Brighten Communications – Earn up to $18 per hour for 20 to 32 hours per week making outbound appointment setting calls. Channel Blend – Hires Idaho residents to work from home providing telemarketing services. City Twist – Offers competitive benefits packages to B2B telemarketers with at least two years’ experience. Cruise.com – Home-based Cruise Sales Agents earn base pay plus commission and must be available for scheduled online training. Bilingual English/Spanish agents are preferred. EduTrek – Seeks experienced college admissions specialists to gain leads for the college-matching system. eTutor World – Flexible schedules are available for experiences sales agents to promote tutoring services. Expert Planet – Earn $12 to $15 per hour as a sales consultant for clients. Grindstone – Hires Sales Support Experts with at least three years of sales generation or appointment setting experience. Happiness Group – Outbound Sales Representatives earn base pay plus incentives like bonuses and a $300/month health care package. Humana – Occasionally hires remote sales agents, but must have medical or nursing experience. I Dial U – Offers a flexible schedule for its agents. Infocision – Recruit volunteers and raise funds for nonprofits and Christian organizations. Intelemark – Hires B2B telemarketing specialists. Intelliverse – Earn paid time off and a competitive salary working for Intelliverse as a sales agent. Lunar Cow – Lunar Cow seeks at-home lead generation and sales specialists and managers. MarketLinc – Become a Sales Agent for MarketLinc and you’ll have regular advancement opportunities based on performance. Marketlink – Has occasional openings for at-home telemarketers. NexRep – Several of NexRep’s clients seek experiences sales representatives to perform outbound calling tasks. Next Level Solutions – Hires Virtual Independent Agents for 20 hours per week. Must have at least one year of telephone sales experience. Oasis Marketing Solutions – Hires call center and marketing agents for a minimum of 15 hours per week and a flexible schedule. OPK Telemarketing – Prefers its telemarketing agents to already have several years of relevant experience. Paragon Planners – Up to 35 hours per week are available for appointment setters. Currently only accepts agents in AZ, CA, CO, FL, ID, IL, KS, MI, MO, MT, NC, NE, OH, OR, PA, SC, TX, WA & WI. Patch – Occasionally outsources its sales opportunities to at-home agents. Pathable – The 100% virtual office sometimes opens positions for sales and lead generation specialists. Phone Force – Provide outbound calling services to a variety of Phone Force clients. Sage – Offers positions for experienced product marketers with strong knowledge of the IT industry. Sales Fish – Must have at least seven years of B2B telemarketing experience and commit to 25 hours per week. Saleschasers – Seeks virtual call center agents to provide sales call services to its various clients. Must live in the U.S. and be fluent in English. Sales Roads – Hires appointment setters, lead generation specialists, and sales professionals to work from home. Full-time employees can get a full benefits package. Synergy Solutions – Has openings for B2B appointment setters. Offers a competitive hourly rate and benefits package. TeleReach – Seeks at-home agents in most states, but excludes CA, CT, DE, FL, HI, MA, MD, MT, NH, NV, PA, or WA. Televated (Review)– Hires for several types of work from home opportunities, including outbound sales and lead generation services. The Appointment Biz – Must have at least five years of telecommunications experience to become a virtual assistant for clients. Think Direct – Hires home sales associates in FL, TN, AL, and SC. Must have at least some call center and sales experience. Ver-A-Fast – Your role will include calling newspaper companies to gauge interest in getting feedback from their customers to improve their services. Must commit to 20 hours per week. Welcome Wagon – Occasionally hires remote sales associates across the United States. Wheelhouse – Occasionally has openings for remote Business Development Representatives providing lead generation tasks over the phone. Windy City Call Center – Offers positions for appointment setters in Florida, Georgia, Indiana, Illinois, and Ohio. Pay starts at $9 per hour and raises to $10 per hour after 90 days. Active Network – Provide call center services to businesses that use Active Network solutions. A competitive benefits package is available. Advanis – Become a Telephone Research Interviewer conducting telephone marketing research surveys. Apptical – Offers a variety of call center positions, including telephone research. Bilingual candidates are preferred. BSG – As a Live Operator for BSG, you’ll help verify information over the phone to combat sales fraud. Earn a minimum of $8.50 per hour. Call Center QA – Get paid as a telephone mystery shopper contacting businesses and providing feedback about your experience. Pays $5 per call and post-survey, which usually totals about 5 to 10 minutes. Causeworx – Work from home as a fundraiser for various clients. Connect and Sell – Connect callers to the proper phone number and get paid from home. CSR – Hires for a variety of phone tasks, including mystery shopping and call evaluators. Must be available for three-hour blocks of time. IPSOS – Collect data and conduct surveys over the phone with a flexible schedule. Maritz Research – Conduct customer satisfaction surveys for various clients of Maritz Research. NextWave – Make calls to people about political issues to raise awareness or transcribe their stories to written words. OnPoint@Home – Hires Advocacy Coordinators to provide outbound outreach services for political issues. Overland Solutions – Hires remote call center agents for a variety of tasks, from appointment setting to lead generation. ParaMeds – Looks for Tele-Underwriters with plenty of experience in the medical field. You’ll conduct interviews that will help determine a caller’s eligibility. People Calling People – Focuses on outbound calling for political polls. Pleio GoodStart – Call people to remind them to take their medications and answer general questions about their medications and health. Sedgwick – Seeks remote workers to assist in filing insurance claims. Must have experience with claims filing. SSRS – Provide quality control over phone-conducted surveys or become a work from home telephone interviewer. Telecare Corp. – Hires Telephone Satisfaction Survey Agents to work from home conducting follow-up surveys to customers of various clients. Bilingual agents get preference. Vocalabs – As a Survey Administrator, you’ll have a flexible schedule conducting surveys after customers place their orders. You’ll get paid within a week after your surveys are complete. Westat (Review) – Seeks work from home data collectors to provide questionnaires over the phone. Shifts are a minimum of three hours each, and you must work at least 15 hours each week. All ready to find a work from home job as a call center agent? Great, and good luck! Don’t forget to come back and let us know how it’s going for you in a comment! I run a virtual call center and am partnered with Arise under NTT Business Solutions LLC. We are currently accepting qualified agents. Plenty of clients to choose from and our company has great incentives. Please visit our website or Facebook page for more information. We are happy to answer any questions that you have. Yes but Natasha your company has fees to start. Most of use looking for work need a job and must have one for bills etc. Start up cost normally are not something someone wants to or can even pay. Demonstrated analytical and problem solving skills together with the ability to make sound evaluative judgments. Track record of meeting and exceeding quality assurance expectations and standards. A reputation as a team player who develops and maintains positive working relationships. Please click the link in the listing to be taken to the actual listing. This is simply a website that gathers job leads from around the internet in one place for your convenience. You have to click the link to apply with the company who made the original listing.